Decalcifying pros and cons of this Anti-scale system. 1 What is water hardness and how it can affect us. 2 Water decalcifiers: What is lime embedded in water pipes.? 3 Main problems caused by lime scale. 3.1 Economic waste problem and energetic. 3.2 Economic problem of breakdowns and repairs. 3.3 Economic problem of detergent and soap efficiency. 4 Solutions to problems caused by lime scale. 4.1 Leave it as is – Do nothing. 4.3 Buy a magnet or other cable system to be placed around the water pipe. 5 How does the Antical RF system work and why is it 100% effective against limescale? 7.1 Buy your ANTICAL RF NOW!!. All the information you need to know to get rid of limescale in your pipes, a water softener can make limescale disappear from our lives. Increase your quality and that of your family by following a few simple steps. Put a water descaler in your life. What is water hardness and how it can affect us. 1 French grade (1ºF) = 10 mg Calcium Carbonate dissolved in 1 liter of water. From hardness of 15ºF (French degrees) or 150 mg/l of calcium carbonate in 1 litre of water, water is already considered to be hard. The hardness of the water determines the incrustation power of that water, due to the presence of calcium carbonate. The harder a water is, the greater its incrusting power due to precipitation and adherence of solid calcium carbonate (lime scale) in the water circuit. Water decalcifiers: What is lime embedded in water pipes.? The lime scale or calcite that is incrusted in the water circuits is the calcium carbonate mineral, solid and with a great incrustant and adherence power in the water circuits and pipes. Use a water decalcifier and the lime scale in the pipes will disappear. The presence of hard, very hard or extremely hard service water for private households, communities of owners, businesses or industrial facilities and factories in general, in their water circuits makes the amount of calcium carbonate that carries water is very high and due to the continuous use of these water facilities (the water is continuously flowing through the circuits and consuming), part of that calcium carbonate that enters with the water adheres in the form of lime scale (Solid calcium carbonate precipitate) and build up lime deposits that cause serious problems. Main problems caused by lime scale. The presence of this unwanted substance, calcium carbonate or lime scale, in water causes it to be embedded in the water circuits and generates a multitude of problems. Economic waste problem and energetic. The presence and accumulation of limescale deposits in the water circuits considerably increases the energy consumption, since the limescale adhered to the installations behaves as an insulator and causes the water in the hot water circuits to take much longer to heat up and requires much more energy (electricity, diesel oil, etc.) in order to reach an adequate operating temperature for the hot water. Economic problem of breakdowns and repairs. The lime scale is accumulating in these equipments and finally they are either blocked or stop working, ceasing to give the service for which they were designed and being necessary to repair or replace them..
Economic problem of detergent and soap efficiency. When soaps, gels or detergents are used, the presence of limescale in the water changes the surface tension properties of these products, making it necessary to use much more of these products to achieve the same cleaning and detergency effect as with limescale-free soft water. The waste and extra energy expenditure of limescale in water, when it is embedded in hydraulic installations, as well as the fact of having to use more detergent chemicals and for washing, makes the presence of lime in water a real ecological problem that increases CO2 emissions and pollutants in water, increasing the carbon footprint. Solutions to problems caused by lime scale. Leave it as is – Do nothing. This is usually the most expensive option, considering the damage that limescale can cause to the hot water system in your home (washers, faucets, showerhead, iron, coffee machine) or in your business (washers, heat exchangers, hot water accumulators, drip irrigation, pumps, sprinklers, nebulizers,…), in addition to high consumption costs. (Only 0.3 mm of formation of lime deposits in your hot water system already leads to an increase in energy costs of more than 20%) and also in abrasive chemicals and strong acids to remove lime scale incrustations.. It is a chemical treatment system that modifies the organoleptic properties of water (taste,…), since basically what these types of systems do in sequestering (holding) the element of calcium (Ca++) that has the water and replacing it, adding the element of sodium (Na+) to the water, so that the water remains balanced. 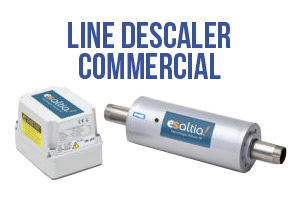 Purchasing one of these systems to solve limescale problems not only means initially disbursing what the equipment is worth, but they also have fixed operating costs, since they consume salt (sodium chloride), and also have high maintenance costs, since it is necessary to perform periodic calibrations to the equipment by trained maintenance personnel. It should also be noted that these equipments carry out periodic automatic washing processes of the cation exchange resins that generate brines that are normally discharged to the public sewerage system and that generate serious environmental problems. CONCLUSION: IT IS NOT A RECOMMENDED SOLUTION, NEITHER CHEAP, NOR RESPECTFUL WITH THE ENVIRONMENT. Buy a magnet or other cable system to be placed around the water pipe. Magnets and cable systems (electromagnets) are fixed around the water pipe. These devices are based on the strength of the magnetic field generated by magnets and electromagnets, so that if the calcium (Ca++) and carbonate (CaCO3-) ions are kept separated in the water, due to the influence of the positive pole (which attracts the carbonate ion) and the negative pole (which attracts the calcium ion) of the magnet or electromagnet, the calcium carbonate (lime) is no longer formed when the magnet or electromagnet is present. The magnetic force of this equipment is not sufficient to remove the limestone layers already existing and encrusted in the pipes and other parts of the hydraulic circuit. In general, this system only works in small installations and if a large quantity of water is consumed. It should be borne in mind that the water is treated for a very short period of time and to protect all the housing or other major installations such as owner’s associations or industrial facilities would require several magnets or electromagnets and not just a single piece of equipment, as normally offered by commercial products of this type. An Antical RF system operates by an electro-physical process of emission of low frequency electromagnetic radio waves or pulses (power pulsed technology) that propagate through water with anti-limescale and decalcifying properties due to the effect of resonance. The system uses variable frequencies between 0.05 and 5 MHz, to prevent the formation of calcium carbonate (calcium carbonate) so that the calcium and carbonate present in the water as they enter the water circuit of the installation treated with the Antical RF equipment, will leave through the points of consumption (taps, sprinklers, pulverizers,…) so that at no time will lime accumulate in the installation, and in addition, the lime layers already existing in the water circuit dissolve progressively as the electro magnetic pulse flows with water through the water circuit. How does the Antical RF system work and why is it 100% effective against limescale? The water contains calcium carbonate colloids, which cause a progressive and rapid increase in the decomposition of bicarbonate ion, and they are deposited in the ducts in the form of lime crystals (trigonal calcite), very compact and encrusting.. The low intensity electromagnetic fields generated by the Antical RF system, due to the effect of resonance, induce an energy such that it alters the polarity of the ionic pairs of CaCO3 dissolved in the water, keeping these particles in a colloidal state, that is, as tiny highly hydrated crystalline particles that remain in suspension in the water until temperatures of 70/75 ºC..
At higher temperatures of 70/75º, precipitation of the ionic pairs in suspension occurs, but not in the usual way in which lime precipitates, such as calcite (trigonal structure), highly adherent, but in the crystalline form of aragonite (rhombic structure), scarcely adherent, practically soluble in water, and which is broken down by the simple mechanical drag that water exerts on the pipes when it flows through them. We should also not forget the descaling effect of the Antical RF system, thanks to which the calcium carbonate incrustations already formed in the water circuits are eliminated: pipes, filters, heat exchanger plates, etc. The resonances generated by the Antical RF equipment modify the polarity of the ionic pairs of dissolved calcium carbonate, and in the same way they act on the crystalline network of the already existing calcite incrustations, reducing their polarity, causing the structure to be less stable. This, together with the crystallographic incompatibility phenomenon and the mechanical and solvent dragging effect that water exercises, are responsible for the descaling effect of Antical RF. Standard Antical RF systems are capable of treating water with hardness up to 200ºF (2000 mg/L) and treating water flows through pipes ranging in diameter from 3/8″ to 30″. However, special equipment can be manufactured on request. The water treated with this anti-lime scale system maintains the anti-lime scale effect between 24h and 48h, i. e. its effects are lasting over time and they are also long-lasting in the distance because its Anti-lime effect is effective for miles, provided there is water continuity of the water circuit that allows the propagation of electromagnetic pulses. The Antical RF system can treat from small water flows typical of a particular home, such as medium flows of water from companies and commercial businesses, as well as large flows of water from drinking water networks, agricultural irrigation systems and aqueducts. The performance guarantee of the Antical RF equipment is 5 YEARS and offers you the security of not having problems caused by lime scale. The purchase price of this equipment is lower than a water softener or salt water softener and the only cost it has is electricity consumption, which is very small, since it is low voltage equipment. Antical RF equipment has no consumables or maintenance costs..
Minimizes the use and storage of anti-lime chemicals such as dispersants, scale inhibitors, corrosion inhibitors, etc. Benefits of having a Antical RF. Increased energy efficiency of water facilities. Maintains the flow of circulating water. Reduces the number of visits for maintenance and repairs. Reduces deterioration and overheating of the water circuit. Increases the efficiency of the cooling system by preventing new incrustations and gradually eliminating old ones. Protects the environment by reducing the load of pollutants in discharge waters. Minimizes the use of chemicals afterwards. It does not use consumables. System 100% ecological and favours the reduction of CO2 emissions. Buy your ANTICAL RF NOW! !.